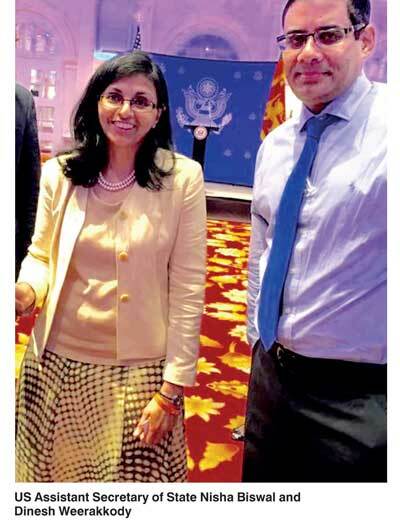 US Assistant Secretary of State Nisha Biswal, currently on her sixth visit in 20 months to Sri Lanka in her current capacity as US Assistant Secretary of State responsible for South and Central Asian Affairs, speaking to a group of senior business leaders at GFH Colombo on Wednesday said former Singapore Premier Lee Kuan Yew wanted to turn Singapore into a Ceylon. Conflicts reversed the fortunes for Sri Lanka, but now it is time to make Sri Lanka the next Singapore. Biswal, a senior diplomat in the US State Department, commended Sri Lanka for taking measures to address human rights issues and pledged that the United States would continue to support the Government in all the challenges towards economic and social development. Assistant Secretary Biswal in her 30-minute address and in her remarks later on said that Sri Lanka has been on a remarkable trajectory of addressing not only the internal issues, but also engaging in with the broader international community in a spirit of partnership and dialogue. Biswal pointed out that Washington has had close ties with Colombo for the past 60 years and assured that her country would continue to make substantial investments in multiple sectors including agriculture, education, health care, energy and natural resources. Her endorsement publicly is very timely for Sri Lanka given the economic woes in the EU and the UK. There is no doubt the support of the United States is key for our future economic prosperity and also for security across the Indian Ocean. Furthermore, around $ 3 billion worth of products are exported into the US annually. The United States has on an ongoing basis made decent investments in multiple sectors including agriculture, education, healthcare, energy and natural resources in the last five years. It is also important to note that Biswal in her address lauded the Government of President Sirisena for joining the Open Government Partnership and for passing the Right to Information Bill, which she said were positive signals of promoting transparency and one of the much-needed ingredients to promote investments into Colombo. The US-Sri Lanka Business Council therefore should aggressively from now on focus on forging public and private partnerships between US businesses and Sri Lankan companies and with the Government of Sri Lanka, especially because in the past United States’ FDI and tourism arrivals have not kept up with other markets like the EU, China and India. However to attract more US FDI, we would need to modernise Sri Lanka’s technology infrastructure, build Sri Lanka’s soft and hard infrastructure and restructure some of the outdated Government policies and committees that make it more difficult for foreign companies to do business in Sri Lanka. These would be a requirement to attract greater US investments. Sri Lanka must also train its workforce in new technologies to ensure that a vibrant startup community led by US funds can create high-paying jobs for young Sri Lankans. While Sri Lanka welcomes the deepening of ties between the two countries and the United States Government’s willingness to continue to support the Lankan Government in all the challenges towards economic development, the United States would also expect Colombo to take measures to comply with the UN resolution to address human rights issues. The US would also expect Sri Lanka to move ahead with its plans for constitutional reform for justice and reconciliation. The United States in return is likely to partner the Government to foster economic development and encourage greater foreign investment and also work with the Sri Lankan Government to advance opportunities for young Sri Lankans. Sri Lanka should certainly take advantage of this special relationship and work out a good balance that does not end up giving a hard dose of medicine to the electorate. In the final analysis, given that US Assistant Secretary Biswal said in her closing remarks twice over that “we are partners, and today our relations are at an all-time high,” our leaders must look towards an arrangement which can bring benefits to both countries, and develop a robust relationship that helps to bring peace and prosperity to Sri Lanka, and finally ensure security across the Indian Ocean, given that Sri Lanka is located just off India’s southern periphery and astride the strategically important east-west shipping route.